Philosophers working within the pragmatist tradition have pictured their relation to Kant and Kantianism in very diverse terms: some have presented their work as an appropriation and development of Kantian ideas, some have argued that pragmatism is an approach in complete opposition to Kant. This collection investigates the relationship between pragmatism, Kant, and current Kantian approaches to transcendental arguments in a detailed and original way. 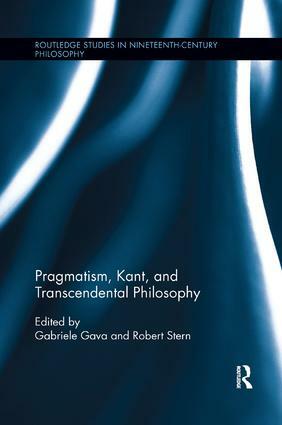 Chapters highlight pragmatist aspects of Kant’s thought and trace the influence of Kant on the work of pragmatists and neo-pragmatists, engaging with the work of Peirce, James, Lewis, Sellars, Rorty, and Brandom, among others. They also consider to what extent contemporary approaches to transcendental arguments are compatible with a pragmatist standpoint. The book includes contributions from renowned authors working on Kant, pragmatism and contemporary Kantian approaches to philosophy, and provides an authoritative and original perspective on the relationship between pragmatism and Kantianism. Gabriele Gava is research associate at Goethe University Frankfurt, Germany. He is the author of Peirce’s Account of Purposefulness: A Kantian Perspective (2014). Robert Stern is Professor of Philosophy at the University of Sheffield, UK.